A couple of days ago I posed a video showing you how to make your own homemade cashew cheese – a vegan alternative to regular cheese that’s healthy, quick and easy to make. 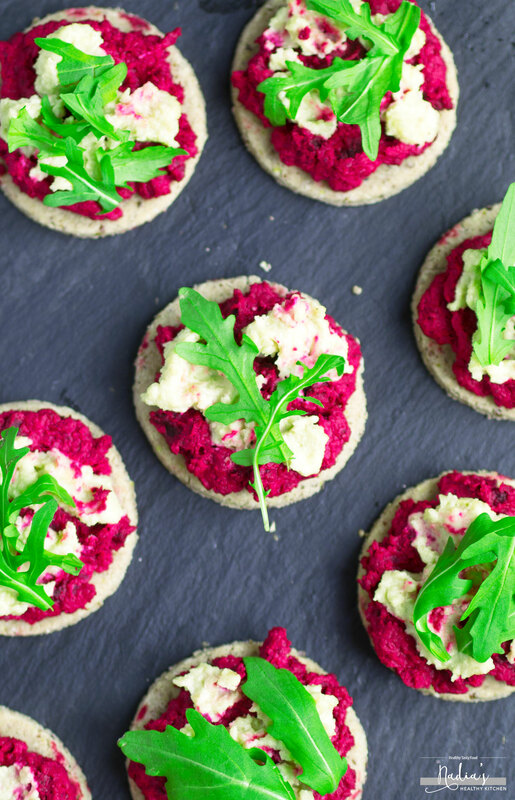 Here’s a simple way to use your homemade cashew cheese, by making these mini beetroot cashew cheese pizzas! I love bite size foods, and I love finger food. Growing up in Iraq we hardly used a knife and fork. We either ate with our hands or with a spoon. Every single day we had rice and a variation of a stew for lunch. For breakfast and dinner we usually ate foods that required no cutlery, like a cheese sandwich or tahini with date syrup and bread for breakfast and things like falafel or kebabs sandwiches for dinner. Maybe that’s why I have such a soft spot for foods you eat with your hands – sandwiches, pizzas, burgers etc. I love bite size food because I feel like I’m eating so much more than I actually am, if that makes sense. Eating five mini pizzas seems like a lot more than eating one regular size pizza, even though I end up eating the same quantity of food. It’s funny how the mind works, eh! 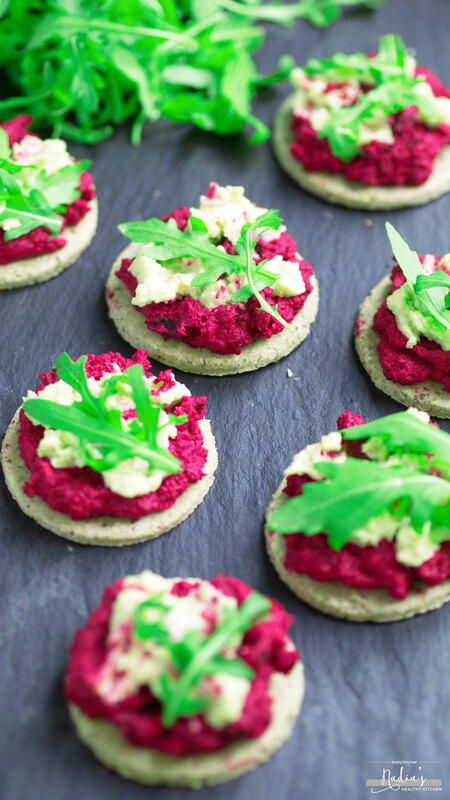 I’ve recently discovered and fallen in love with beetroot hummus. As a hummus addict I eat the stuff almost everyday without fail! Because I eat so much of it and have to turnover such huge volumes every week, I usually just keep it simple and make my basic hummus recipe. That way it’s quick and I don’t have to think about it. 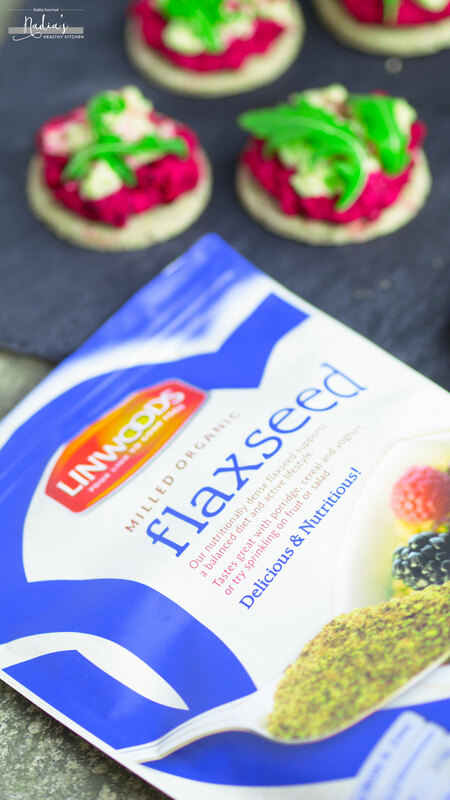 But when Linwoods asked me to create mini vegan pizzas, I had to think outside the box and come up with something a little more exciting. 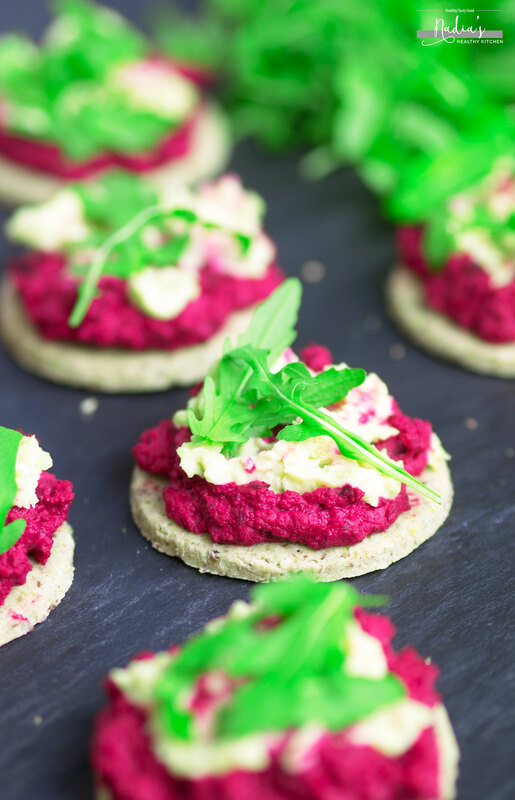 I had seen pictures of beetroot hummus on Instagram and had this idea that since beetroot has such an overpowering taste it would take over the taste of the other ingredients like the chickpeas, tahini and lemon juice. The end result was so delicious, much nicer than I had imagined. The taste of beetroot does come through, but nowhere as strongly as I had initially thought. It also adds the most beautiful fuchsia pink colour that’s just so irresistible and eye catching! This recipe is a fun twist on a traditional pizza – completely vegan and gluten-free and so much healthier than wheat and cheese based pizzas! Mix the flour, ground almonds, baking powder and salt, then add in the flax egg, coconut oil and water. Kneed with your hands until you have a dough that’s not too sticky or dry. Roll out onto a floured work surface. Using a round cookie cutter, start cutting out the mini bases. Transfer onto a baking sheet covered with parchment paper and bake for 8-10 minutes. Preheat your oven to 200*C (180*C fan assisted). Place the beetroot cubes onto a baking sheet and drizzle with olive oil. Bake until soft (around 30 minutes). Leave to cool completely before blending all the ingredients together in the food processor until smooth. Start assembling your pizzas by spreading a layer of the beet hummus onto the bases, then top with some of the cashew cream. Decorate with rocket. ** This post was commissioned by Linwoods; however, all opinions are my own. I absolutely adore the vibrancy of these – nature really does have the best colours, no additives requires! What a beautifully colour. I love that beetroot brings every dish to life. Adorable! I love my beets and cashews of course! What a unique idea!!! These are simply gorgeous. I really need more beets in my life and this is a great place to start.